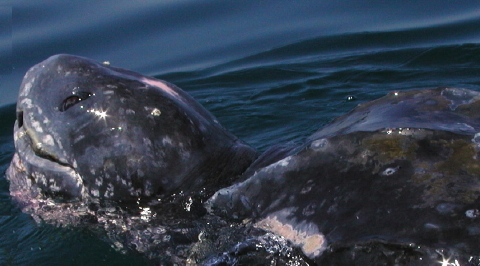 Leatherbacks achieve this massive size by feasting on a diet almost exclusively composed of jellyfish. 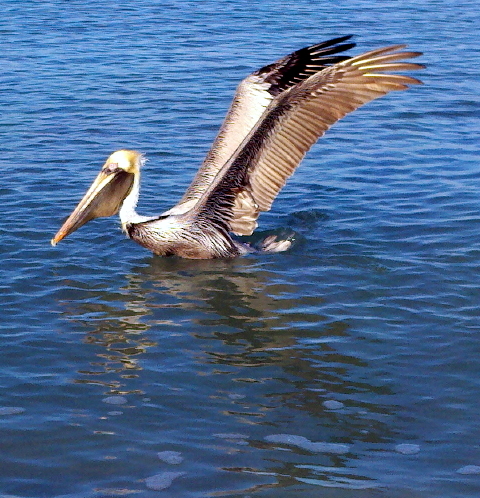 They follow jellyfish blooms across the Seven Seas. 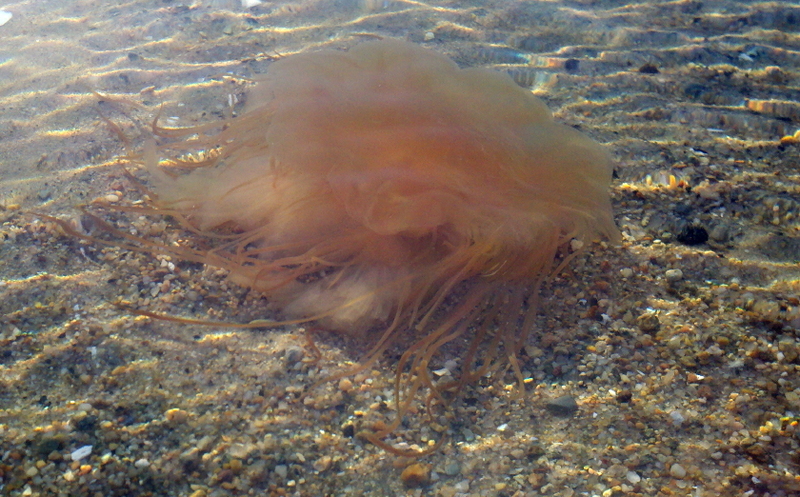 In Buzzards Bay, the attractive prey that entices leatherbacks to return each year is lion’s mane jellyfish (Cyanea capillata). 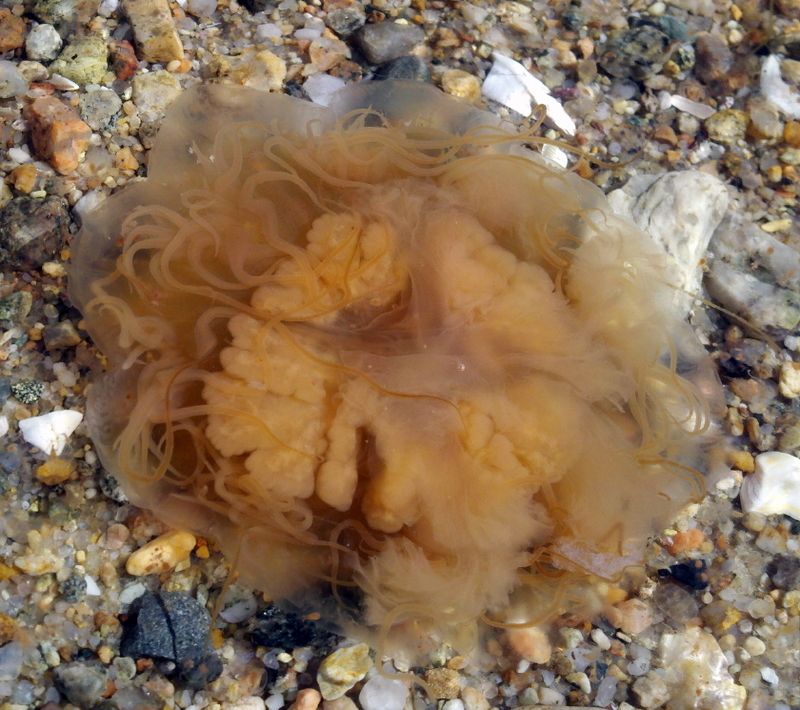 So, each spring the Turtle Journal team watches the shores of Buzzards Bay for the first appearance of a lion’s mane bloom, which presages the arrival of our favorite leviathans. Today, ten days later than last year, the first lion’s manes appeared along Silvershell Beach in Marion. Now that Buzzards Bay is filling with lion’s mane jellyfish, we can anticipate the arrival of the season’s first repitilian leviathans in a matter of weeks. If jellyfish are the breakfast, lunch and dinner of these giants, how are leatherback sea turtles configured to exploit this unusual diet to gain such massive sizes? Since jellyfish congregate in patches amidst the vast empty distances of the oceans, how can leatherbacks take advantage of a good spot when it comes along in their pelagic journeys? 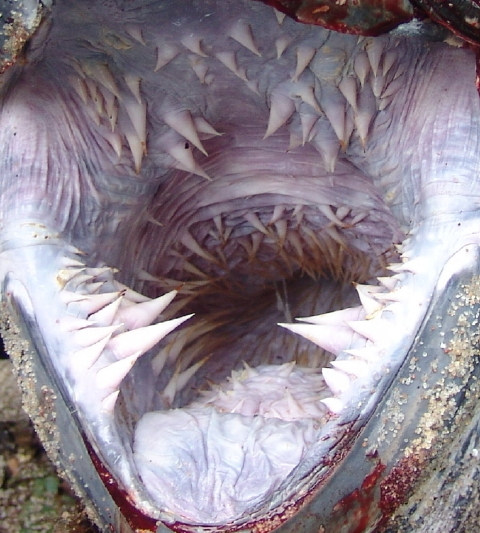 Look at the the enormous mouth of the leatherback sea turtle and its specilized esophagus lined with long, downward pointing spikes. For a jellyfish, and anything else that enters, the leatherback GI system is a one way journey downward. 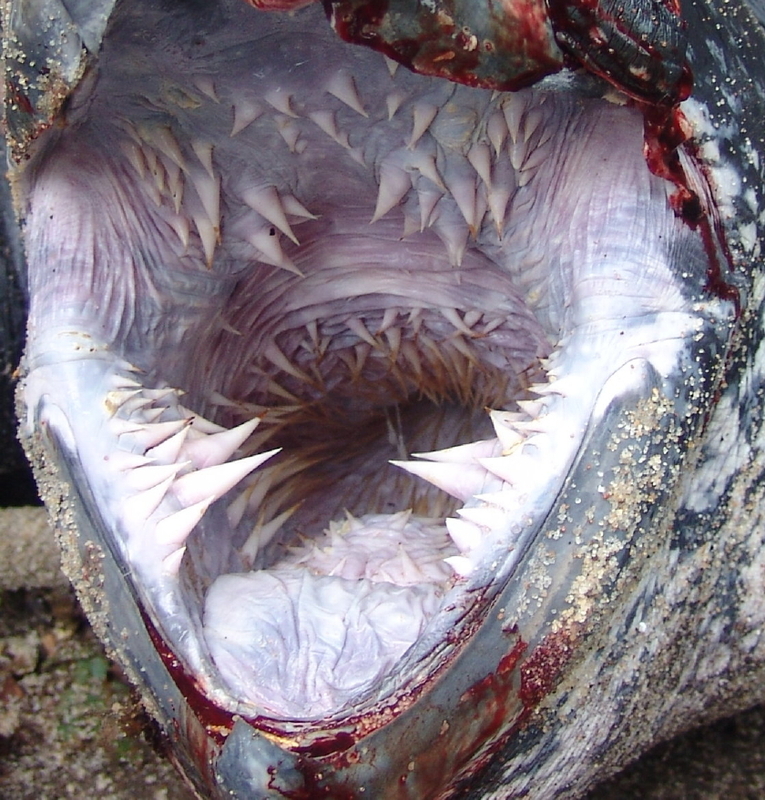 When a leatherback runs into a patch of jellyfish it gorges itself, filling its mouth, esophagus, stomach and intestines with a bulging mass of food. Another interesting anatomical feature of the leatherback is its enormous liver which processes the generous supply of toxins that it consumes from its jellyfish prey. 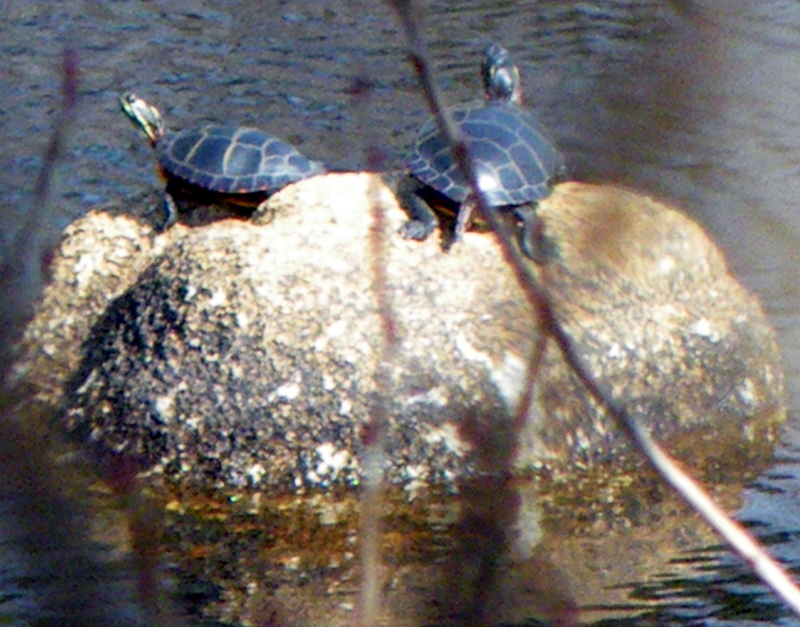 During the last week we’ve seen painted turtles decorating rocks at our local bogs and on the floating platform at Wellfleet Bay Wildlife Sanctuary. 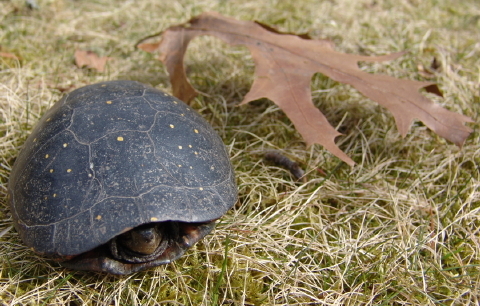 Yesterday, Sue spied two small juvenile spotted turtles sunning on the far, unapproachable banks of the pond at Brainard’s Marsh. 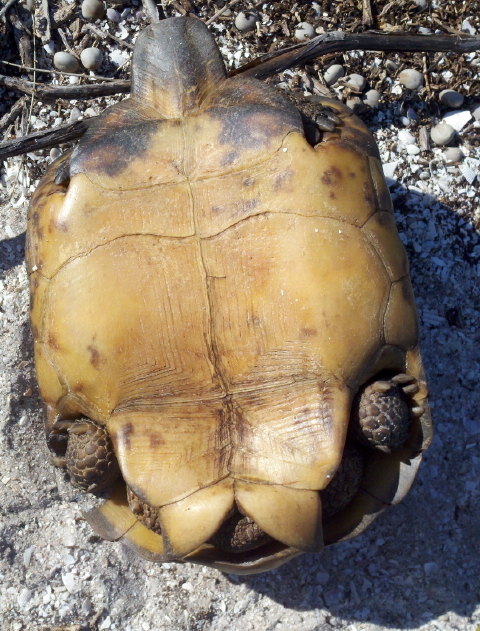 So, this morning Sue came to Brainard’s Marsh ready for action with a long handled (10 foot) net to snag this handsome dude basking on the bank and to kick off the Turtle Journal’s local research season. 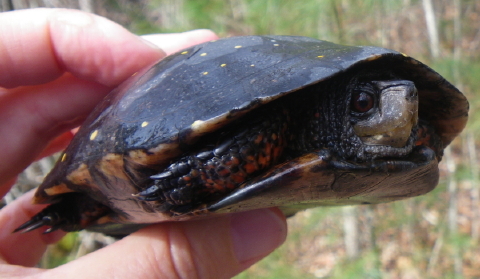 Spotteds are an extremely elusive small fresh water turtle. For sizing, note the oak leaf in the photograph above with the mature male spotted turtle. 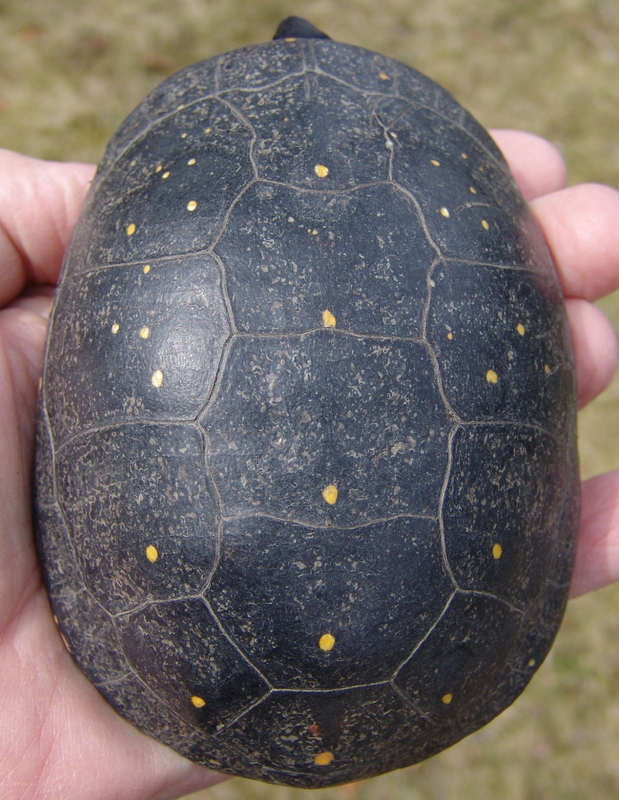 This 12-year-old male measured 11.6 centimeters (~ 4.5 inches) straight-line carapace length and 8.7 centimeters (3.4 inches) maximum straight-line width. His plastron measured 9.7 centimeters (3.8 inches) long with a nice male concavity and thick tail. Our lad hit the scales at 211 grams (7.4 ounces) and didn’t need to be marked because he had natural nicks at the 2000 suture and in the 3 marginal. 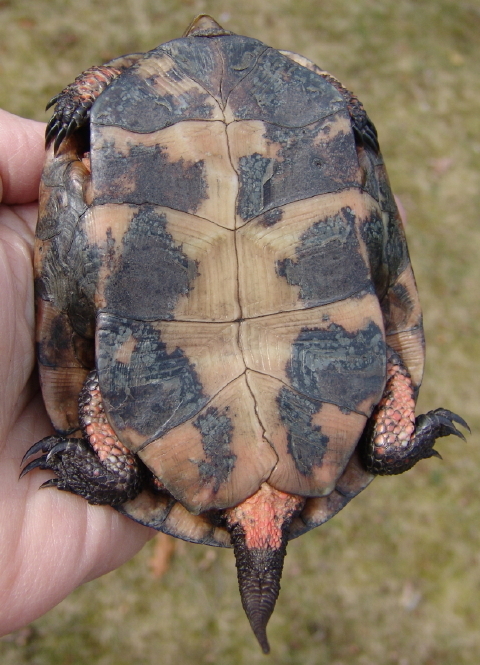 Some future St. Patrick’s Day researcher may be flummoxed by finding a turtle marked as #2003 in a tiny fresh water pond. Perhaps, that future researcher will be clever or lucky enough to attritube those marks to a pint (or two) of green beer. For turtle researchers (and Turtle Journal), March can be the cruelest month as we wait for our local turtle species to rise from long winter brumation. 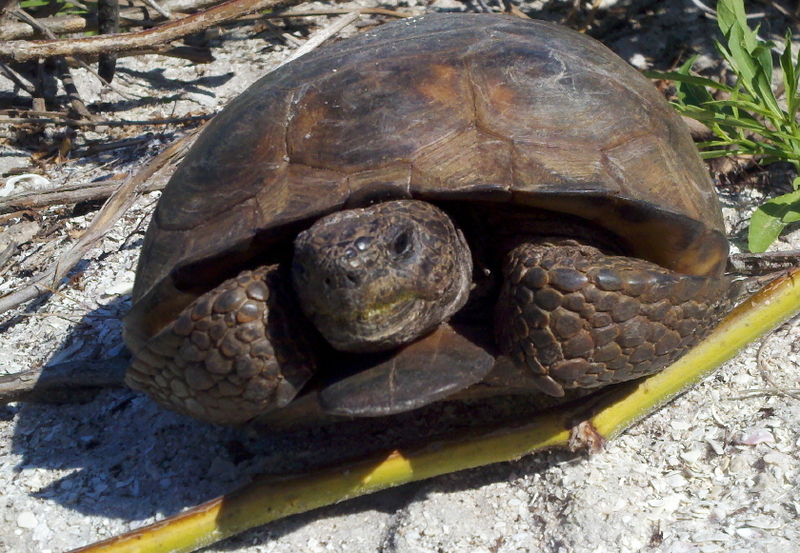 The perfect fix is a trip to the Florida Gulf Coast and a visit with these tank-like gopher tortoises. As Turtle Journal’s Sue Wieber Nourse walked Vanderbilt Beach in Naples this week and enjoyed the beauty of the Gulf Coast’s wildlife, she encountered a fabulous male gopher tortoise preparing for the spring season. A middle aged turtle of size and stature, he was still a bit chilled by the front that had passed through Florida the end of last week. The close up of his left rear pad made us wonder how different it would be dealing with specimens of this bulk during our research season here in the Great White North. 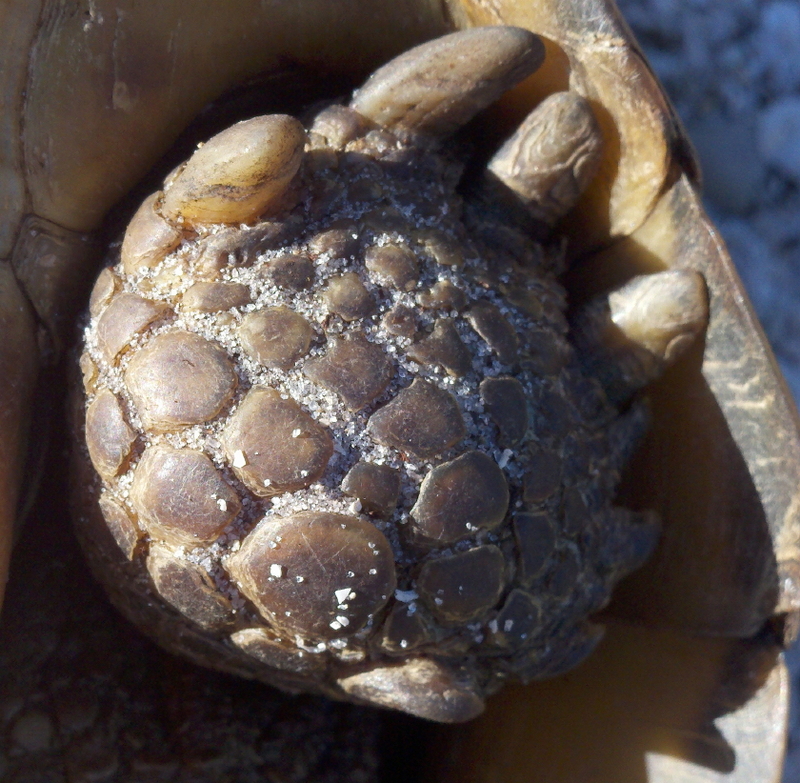 Just down the beach from where this gopher tortoise resides in the literally “richest” turtle property in the world, Sue spotted a new addition at the Ritz Carlton’s Natures Wonders display. 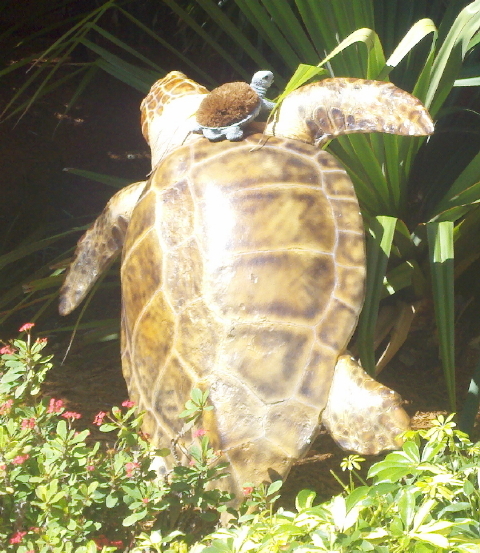 Is that a hatchling or perhaps a totem to encourage another record loggerhead nesting season on Vanderbilt Beach? 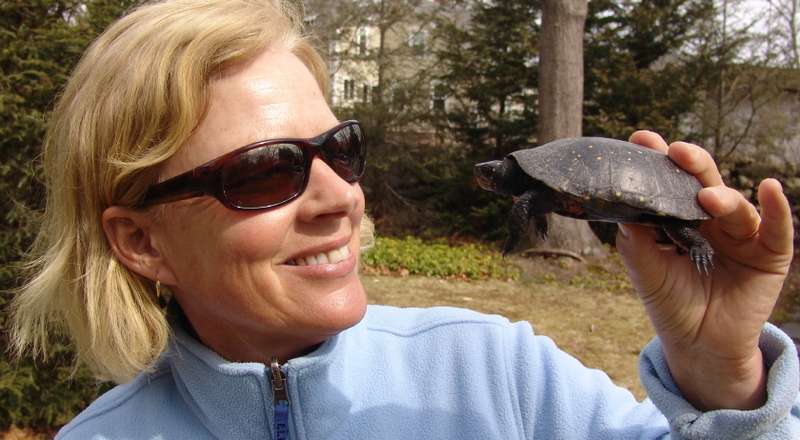 You are currently browsing the Turtle Journal blog archives for March, 2011.